JULY 2018 • FOODSERVICE EQUIPMENT & SUPPLIES • 51 HEAD 1 Head 2 B ehind any kitchen upgrade lies the drive for greater ef- ficiency. Many chefs dream of a complete renovation. Not every operation, though, can fund an extrava- gant redesign in the back of the house. That was the case at Fort William Henry Hotel and Conference Center, a historic 163-year-old property in Lake George, N.Y., near the foothills of the Adirondack Mountains. With a constant list of items in need of repair, the board of entrepreneurs that own the property, as well as a nearby Best Western hotel, must pick and choose where to allocate funds. Areas most visible to guests tend to receive funding first, with back-of-the-house spaces often taking a back seat. "It's hard to fund it all," says Dan Palmer, executive chef and food manager at Fort William Henry. 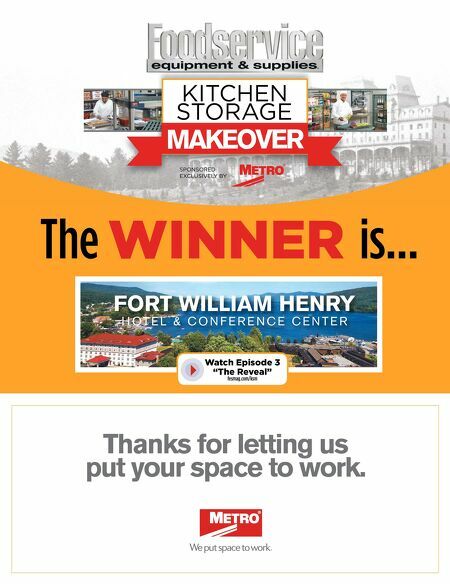 Two years into his tenure at the property, he was looking to jump-start things a bit more when along came the chance with FE&S' Kitchen Storage Makeover contest. Contest judges were stunned at the primitive appearance of the storage areas, which they felt almost dated back to the dark ages. The problems were many, as were the opportunities to take an out- dated, underperforming space and turn it into a well-planned-out kitchen. And that's exactly what happened. 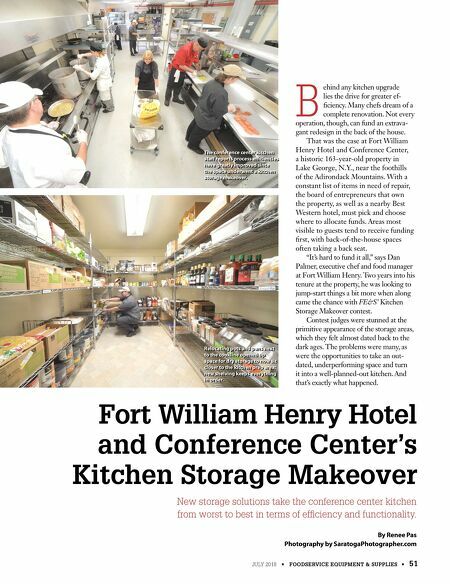 Fort William Henry Hotel and Conference Center's Kitchen Storage Makeover New storage solutions take the conference center kitchen from worst to best in terms of efficiency and functionality. By Renee Pas Photography by SaratogaPhotographer.com The conference center kitchen staff reports process efficiencies have greatly improved since the space underwent a kitchen storage makeover. Relocating pots and pans next to the cookline opened up space for dry storage to now sit closer to the kitchen prep area; new shelving keeps everything in order.